No, it’s not a fancy kind of jewelry. Its not something you do in deference to your goofy friend named Parker. (ie; “Chris – stop “Parkering” – you look ridiculous.”) It’s not a circular playground. It’s Parking. In Denmark. Seems straight-forward – right? Now that you know what it means – of course it’s PARKING. Makes sense. Right? “Boarding and alighting allowed?” What does that mean? Am I doing it? Is it the correct hours for alighting? I feel like alighting something. HA! Got you! (Or me rather, it got me. It did. It has. It will again I am sure.) Not straight forward. Lots of translation required. And I have failed multiple attempts at that translation. Loading and unloading allowed apparently. What is the parenthesis for? A different day? And only in this 18m? Where do you have to pay for parking? Just about EVERYWHERE. When do you have to pay? ALWAYS! Ok, you get Saturday night after 5pm through Sunday as a break. 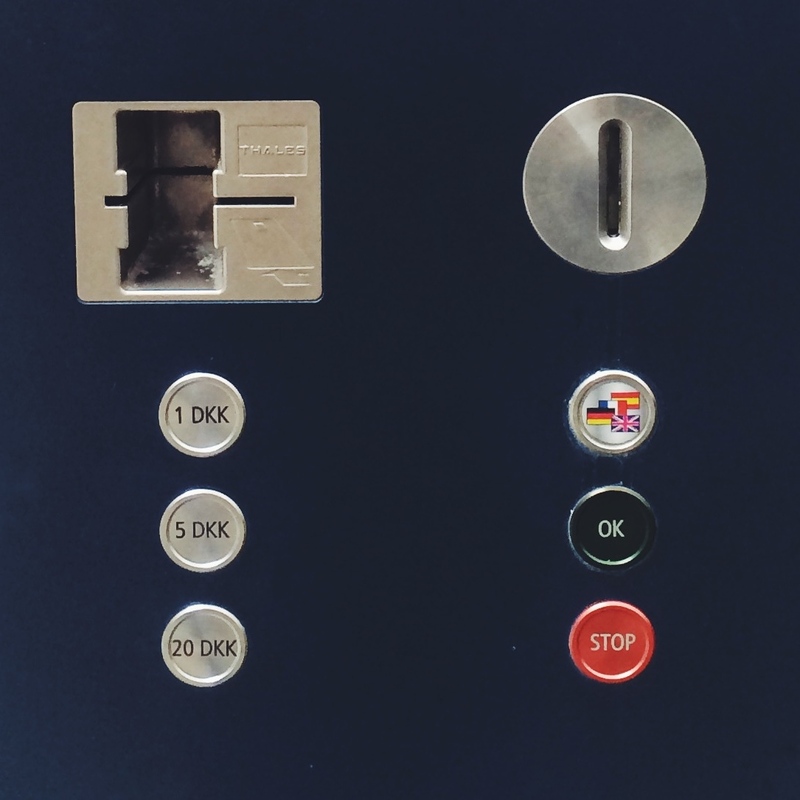 Find one of these machines – press the British flag button so as to understand slightly what you are paying for. You can only use a European debit card that has the chip/pin system. That took us a month to get. Your average American bank does not just give those out. Most US banks don’t even have them yet. Get with the system US banks! Or Danish Kroner, the machines also take Danish Kroner. (Danes do not accept Euros here and no where else in the world accepts DKK. There are holes in some of the Kroner. And the paper money is pretty. Prettier than our plain green bucks stateside. The kids think they are cool.) Plunk in your coins or code in your pin and get your ticket. Place it in the window and make sure you read ALL THE SIGNS. And don’t park past the yellow triangle on the street. Else…. TICKET! Yep. Maybe you know these. Maybe you’ve been here. Maybe you live here. Maybe some other country that you have visited uses these. WE DON’T HAVE THESE in Oregon. Do other US states or American cities use these? I had never seen them before coming to Denmark. So ok. Change the dial to the time you park. You get one hour gratis at the grocery store. “Great!” I think. I saw that 1 time gratis sign. (In my head I may have said – so next time, its not free?) You might get more free time elsewhere – just make sure you figure it out and set your dial before you leave your car and return before allotted time. Else…. TICKET! Back to the grocery store. Groceries are very expensive here and there are apparently government limitations on the grandness (or not so grandness) of grocery purveyors physical establishments – they can only be so big. So as to make the best use of space, they sell things in smaller containers. MILK. For instance. You can only buy 1 quart of milk at a time. This is challenging for a family with growing children who probably go through a quart a meal. Or more. I am constantly buying, carrying up 5 flights of stairs, lots of MILK. Thankfully it is delicious milk. As is the smør (butter), yoghurt, cheese and all other dairy. Happy cows make happy cheese. Did I hear that somewhere? ANYWAY – I digress. I had some time to wander the aisles of SuperBest – which is lovely grocer I will add. I used my currency converter and google translate apps to really strategically shop and do my best to make at least two days worth of meals out for 450 DKK (about $75.00 USD). Feeling quite pleased with myself for procuring the organic produce, good Danish pork loin, MILK (maybe some Haribo gummy treats for the kids and some adult beverages) and more, etc., etc., et al. All of this, in definitely under one hour. GRATIS, remember? I return to my vehicle to find a farging parking ticket. It is very nicely placed in a little plastic sleeve right under the windshield wiper by the dial-y thing. I quickly scan the lot for a sign I may have missed. Did I park in the handicapped spot or other specialty labeled zone? No kidding. Boo. How much was the ticket you wonder? 650 DKK!!! ($110 USD) Just think what groceries I could have bought with THAT! Or what other piece of IKEA furniture I could have procured. I was really coveting the Vittjsö, even though I can’t pronounce it. Boo. Balloon deflated. But, bootstraps pulled up. Marching on. Remember to move your dial-y thing. Whatever that is in your life. We all have one right? Helpful links that I maybe should have looked at that hopefully will help you! All this leads to the fact that we should probably ditch the car and just ride our bikes like the other half of the Copenhageners! Except don’t miss these signs! No Parking on Torsdag – someone is getting a ticket… and it’s NOT ME! Oh what’s that you say? Today is NOT Torsdag? Its Tuesday. That’s not Torsdag? Oh Thursday. Ok thanks. Godt Nytår from Copenhagen! Happy New Year! Hope this is the earlier version of the parking ticket story and not a repeat!